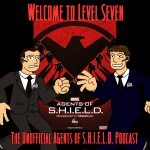 http://media.blubrry.com/w2l7/p/media.blubrry.com/noodlemx/p/welcometolevelseven.com/wp-content/podcast/WTL7_063.mp3Podcast: Play in new window | DownloadMarvel’s Agents of S.H.I.E.L.D. returns! Episode 1 of season 2 — “Shadows” — is today’s topic and we jump right into it! From Agent Carter at the beginning to Crucher Creel at the end, there is so much to talk about!